This past Saturday was girlfriend’s day! I cannot believe I didn’t take one picture – insanity, I know. But the day is forever etched in my mind and heart and the deliciousness of the meal is still dancing on my taste buds – yes, it was THAT good. We are church friends. Our ages span about twelve years. We are all married. We all have adult kids. We all have grandblessings. We all love Jesus and each other. I refer to these gals as my Tennessee besties! There are four of us and there are four seasons per year – yes, you guessed it we all get to host a seasonal luncheon – I get summer and because of schedules we usually gather at our house late August, just in time for yellow jackets, so we eat inside!!! It’s a time to be fussy with the table settings and maybe a centerpiece, a glass of wine (with lunch – don’t judge! ), too much coffee with dessert and lots of conversation. Girlfriend Day Rule #1: NO GOSSIP. But, it’s a time to vent (if necessary), cry (we have on occasion), pray spontaneously, and we laugh A LOT! What goes on at Girlfriend Day – Stays at Girlfriend Day! Like Vegas without the neon lights! So, what did I fix? I used a three-pound, locally raised, grass fed, organic London Broil. Score the meat and rub the garlic into the surface – both sides. Combine the rest of the ingredients above and put into a glass baking dish big enough to hold the meat. Place meat into marinade, cover with foil, refrigerate overnight. While you can (don’t wake up through the night) flip the meat. Prior to putting the salad together you will grill, broil, or sear in a screaming hot cast iron vessel with olive oil, the meat. Eight minutes on each side. Turn heat off, let rest off of heat for 30 minutes. Remove from cooking vessel and place on cutting board covered with foil, allow to cool. Slice diagonally in thin slices and just let sit. Shake well – set aside. 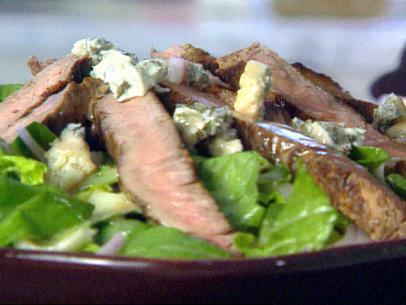 Place strips of cooled meat in a pretty design on top of salad. With this awesome salad I served baked white and sweet potato halves, warm crusty bread and fresh butter. For dessert, my friend Marie Callander came over Friday night and made a coconut cream pie – Marie is generous like that, always ready to visit and bake! The meal was fabulous. The fellowship phenomenal. The fun outrageous. The friends? Well, we are just the bestest! YUM! Sounds like a blast! I think my girlfriends and I need to have girlfriend day soon!!! YES, Tara, and special it up because girlfriend’s are so dang special!!! Fabulous! And, yes, you gotta love Marie! You have never once had Marie in your kitchen – you baking diva!!!! Dressing? Excellent! Oh yes, Marie and I are fast friends!